A recent trip affirms the potentially positive impact of overseas aid. With budget airlines offering cheap and frequent flights, Laos is known to many Australians as a great destination for an affordable holiday. The country is a fixture on the Southeast Asian backpacking trail, and Australians are no strangers to the array of bars and restaurants in tourist hotspots like Vientiane, Luang Prabang and Vang Vieng. Earlier this month, I joined a delegation of seven Australian members of parliament on a trip to the communist one-party state – one of the few still remaining on the planet. Unlike many of the Australians on our plane however, we were not there for kayaking or hiking. We were there to get a first-hand account of the impact of Australia’s aid program, which after Japan’s is the second largest in the country. Enjoying impressive economic growth in recent years, Laos has come a long way since it first began to open up its borders in the late 1980s. Yet despite impressive economic gains, poverty remains widespread. An estimated two million people – 33 percent of the entire population – still live below the poverty line of $1.25 a day, and many more live not that far above it. Just as shocking, Laos has one of the highest child mortality rates in the region. Almost 1 in 10 children will not see their fifth birthdays, due primarily to preventable and treatable causes. Development assistance from countries like Australia can help play a critical role in addressing these causes. Indeed it already is through its strong support of organizations like Gavi, the Vaccine Alliance – an innovative public-private partnership with the goal of creating equal access to new and underused vaccines for children living in the world’s poorest countries. Australia’s work with Gavi as a funding mechanism to support immunization and stronger health systems plays a key role in negotiating lower vaccine prices for developing countries such as Laos. With the support of Gavi, Laos has been able to introduce a wide range of new vaccines to protect against potentially deadly diseases such as measles, pneumonia and rubella. More recently, Laos became the first country in the region to introduce the vaccine for human papillomavirus (HPV) – a virus known for causing virtually all cases of cervical cancer. Traveling to a school on the outskirts of Vientiane, the MPs on the delegation were able to witness up close children being vaccinated with the relatively new HPV vaccine. Not only were these vaccines partially paid for by Australian dollars however, but the Australian researcher, Ian Frazer, is widely credited with having played a lead role in their development. Hence we got to see both Australian aid and Australian science at their very best. The benefits of such investment speak for itself. 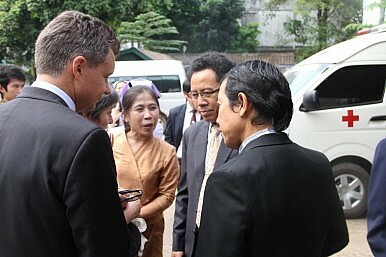 As Matt Thistlethwaite, Labor’s Shadow Parliamentary Secretary for Foreign Affairs, said during the trip, aid does not just lead to “better health outcomes, it strengthens economic growth and ensures living standards continue to rise.” And this is not just in the interests of the people of Laos. Healthy children will become productive citizens capable of consuming Australian goods and services. Nonetheless, much remains to be done. Gradually taking onboard a greater share of the costs associated with its immunization program, the Laotian Health Ministry stressed that at least for the next few years it will continue to require assistance from countries like Australia in order to reach all children with basic vaccines. Currently, roughly 1 in 5 children go without, although this is fast changing. Given the debates underway in Australia about cutting overseas aid even further, this trip served as a reminder about its value. While some of the MPs on the trip may have been skeptics at the start, I have no doubt that they left with an appreciation that while bad aid certainly exists there is also no shortage of life-saving, effective aid programs. One coalition senator even described as “dangerous” the views of those “on the fringes calling for the abolition of our aid program.” I hope he now has the insights needed to convince the rest of his parliamentary colleagues of this view. Michael Sheldrick is currently the Head of Global Policy and Advocacy with the New York-based Global Poverty Project and was Young Western Australian of the Year in 2013. Follow him on Twitter@micksheldrick.